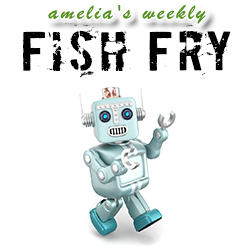 Robotics is the name of the game in this week’s episode of Fish Fry. Allan Martinson (COO – Starship Technologies) introduces us to a new robotic delivery system coming to a city near you! Allan and I discuss the details of Starship’s autonomous 6-wheeled robotic vehicles, how embedded vision sets their autonomous vehicles apart from the rest of the robotic pack, and where he sees robotics headed in the next decade. Also this week, we check out a hydraulically-powered robot called PDAD (Power Driven Articulated Dummy) created for NASA in the early 1960s to test spacesuits. Looking for a curiosity for the office, or a date to your (not-so) favorite cousin’s wedding in a couple months? This robot and all of its (kinda creepy) glory can be yours in an upcoming auction in Cambridge, Mass.